The Storm Womens SP3 Wide Width takes high performance womens bowling shoes to the next level. 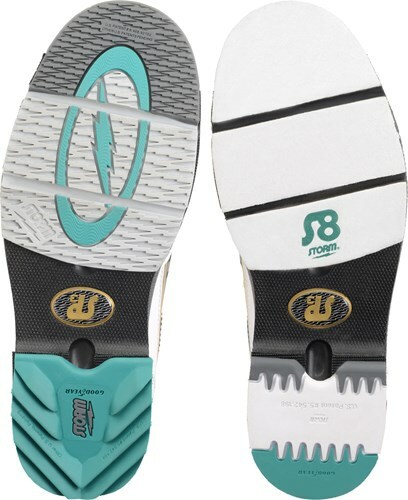 The Toehold Hyperflex Engineering (THE) was developed to increases the flexibility and durability of the shoe. Nothing was forgotten in high performance detailing of this bowling shoe. Well made shoe definitely worth the price. I ordered the 7.5 W since I have a 7WW size foot and bowling shoes do not come in a WW width. It is fully cut but too long in the foot. So I went back to the 7W. Problem here was that I could not get my foot past the seam at the bottom of the tongue by the bottom lace. Ended up returning them. Does the true fit guarantee mean if I don't like how they feel I can return them? The True Fit Guarantee is a one time fee of $5.99 and we send you a pre paid shipping label with your shoes, in case you needed to exchange for a smaller or larger size. The True Fit is only for the same shoe for exchanges just a different size. Do these come with interchangeable soles and should I specify being right or left handed? It will come with interchangeable soles on the shoe. You can specify if you like but they will more than likely be set up for a right handed bowler. If you are a left handed bowler, you can just switch out the soles. Due to the time it takes to produce the Storm Womens SP3 White/Black/Gold Wide Width ball it will ship in 2 bus. days. We cannot ship this ball outside the United States.